With filming on Ant-Man 2 slated to get started this June in Atlanta, the pre-production process has already gotten under way on this Marvel Phase 4 sequel. Today we have word that, during the production, this sequel will be filmed under the secret working title of Cherry Blue, so if you see any signs in Atlanta for a production called Cherry Blue this summer, that likely means you're somewhere in the vicinity of the Ant-Man 2 set. Now that pre-production has gotten started, perhaps we'll get the first casting updates soon. MCU Exchange discovered the working title posted on a preview for the next issue of Production Weekly. The full issue of Production Weekly will be available on Thursday, and there is speculation it may include the first official synopsis, so hopefully we'll have story updates on this highly-anticipated sequel by week's end. 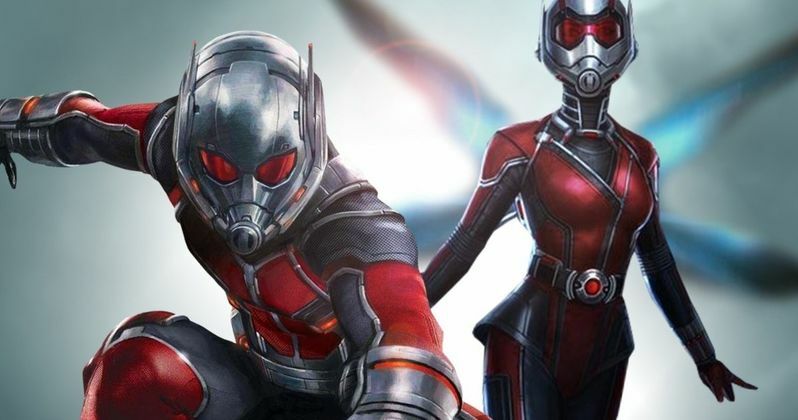 Paul Rudd and Evangeline Lilly have long been confirmed to reprise their roles as Scott Lang/Ant-Man and Hope Van Dyne/Wasp, but we recently got confirmation of a few more returning cast members. After months of speculation, Michael Douglas finally confirmed last month that he will be back as Hank Pym in Ant-Man and the Wasp. Shortly after the first Ant-Man movie opened in the summer of 2015, Michael Douglas revealed in an interview that he would love to come back as Hank Pym, but only if the writers lessened the amount of "expositional dialogue" his character Hank Pym had to say. With the actor getting ready to play Hank Pym again, it seems that condition was met. It was also recently confirmed that Michael Pena will be back as Luis, although it remains be seen if David Dastmalchian and T.I. will be back as Luis' criminal partners Kurt and Dave. Peyton Reed returns to direct Ant-Man and the Wasp from a script co-written by star Paul Rudd and the writing team of Gabriel Ferrari and Andrew Barrer, who served as the on-set writers while the original Ant-Man was in production. They put in over six months of work into the script, but didn't receive any screenplay credit for the first Ant-Man, which was written by Paul Rudd & Adam McKay, along with original writers Edgar Wright and Joe Cornish. Ant-Man went on to gross $180.2 million domestically and $519.3 million worldwide, from a $130 million production budget. It hasn't been confirmed yet if this sequel will have a much bigger budget or not. It is also believed that this sequel will introduce the original Wasp, Janet Van Dyne, the mother of Evangeline Lilly's Hope Van Dyne. There has been rumors that Sharon Stone has already signed on for this role, after it was revealed in a magazine profile last summer that the actress had signed on to play a secretive superhero in an unknown Marvel movie, which many believe if Ant-Man and the Wasp. It was revealed towards the end of Ant-Man that Janet was lost in the Quantum Realm and never returned, but after Scott Lang managed to come back from this mysterious place, it's certainly possible that Janet may come back as well. With pre-production getting under way, hopefully we'll learn more about Ant-Man and the Wasp very soon.